Jucy aka Jucy reads, offers insights, consultation, and coaching for celebrities, professionals, businesses, corporations, other psychics, and everyday individuals who are seeking objective insights, ideas, recommendations, and support for their professional and private lives with tarot, astrology, and numerology. She has been quoted around the Internet in regards to her work on intuition and has developed the EAT method for self-tarot reading as well as the Like Me Principle. Her fees reflect her devotion to giving you her undivided attention, her education and work experience, superior ability to offer meaningful insights and advice, and sincere desire to see you succeed in everything you want to accomplish. She is a certified professional tarot reader CPTR. A session with Jucy consists of a variety of approaches: reading (tells), coaching (asks), counseling (heals), consulting (advises), exploring (discovers), and guiding (teaches). In this way and others, Jucy is very different from your average psychic reader, tarot reader, astrologer, numerologist. With that said, there are many above average readers and Jucy is happy to be connected to her peers should there be a need for a recommendation outside of her service ability. A full one hour session starts with an emailed insight report that serves as a solid foundation for your live session, moves to receiving a session package to get you ready, then the actual session which will uplift, amuse, and help you. Within a week of the session, receive a session follow-up at no extra charge as requested. Working with Jucy isn’t about getting amazed at what she says, seeing her power full on, or being entertained (though you may feel that way). A session with Jucy is about healing you and your life. What can you expect from a session with Jucy? Jucy Arthur does not work with spell casting, black magic, voodoo, etc. ; however, she can help you manifest desires that harm none, view things in a new light and act in ways that will remove negativity in your life. This Toronto Psychic approaches your everyday practical life questions using spiritual and practical tools. She will read your energy and personality like a book and then go into the past, present, & future to look at aspects of your life (see code of ethics) that you have come to see her about. Jucy most often works with strong women who are in positions of authority and whom many may fear or be intimidated to speak their truth which causes problems with being supported. Her clients are often tough and at the top of their game yet missing things in their life. Her clients don’t have the ideal life that others might say she has. Jucy’s clients life is just as confused, hard, and challenging like the next person and her stress levels are often huge. 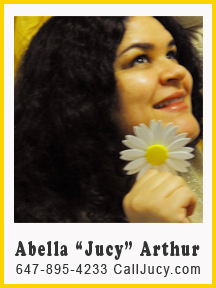 Psychic Jucy aka Jucy is friendly and warm, yet tough and firm when necessary. If one has preconceived notions about what a psychic is and does, she respectfully requests to remove those thoughts as she blasts through that label into a multifaceted talent that is here to serve you in ways you never imagined. As a psychic certified professional tarot reader CPTR residing in Toronto, Ontario, Canada, one can expect advanced reading ability that answers all the hard questions relating to time or amounts (when, how much), specifics about people (what they look like, age, height, weight, what they do for a living, who they are on the inside and the outside, how they feel, think, what they are saying, etc. ), locations, job functions, situations, & events. She also uses a number of reading tools other than Tarot to sleuth out insights. In addition, Jucy likes to focus on manifestation, abundance, and communication techniques, strategies, and ideas to help her clients gain access to happier, fulfilled, and healthier lives. She has also recently added Psychic Life Coaching to her professional services with much success. Jucy values: professionalism, privacy, integrity, being people-focused, building rapport, quality, knowledge, accuracy, passion, and going the extra mile. Her personal mission is to deliver readings which lead to a better understanding of self, others, situations, and events in the past, present, and/or future. Therefore helping you communicate with yourself so you can communicate effectively with others. Jucy’s intense interest in people drives her to motivate and empower those who want success. She has a can-do attitude! Words like: no, impossible, and can’t are not part of her vocabulary. Jucy is about solutions and options. She truly cares about each and every person she serves. She is here to offer wisdom, enlightenment, motivation, and education. Seeing your success and happiness keeps her doing what she does. She helps you communicate with yourself so you communicate with others. She recognizes that authentic communication with self and others can be difficult and she gives you the inspiration and tools to promote the star that you are. Hi Jucy, Thank you sooooo much- it was very special time for me to have a session with you. Your reading was very insightful and realistic….as you know l’ve had many times of reading and spiritual sessions before, but your session was definitely outstanding and there were something special. As if l had a certain type of healing session- actually there were not much (dramatically) good news or predictions, but l became to feel much better and peaceful after l finished your session. l’m very glad to get to know someone very special like you. So l’d like to keep in touch with you and will have a session with you again. I thought the whole process and communication was very well done. It was easy and enjoyable! Thank you for the very insightful and informative reading. I will certainly take your advice when looking for jobs. I was impressed with Jucy’s ability to connect over the phone. Wonderfully enlightening. Jucy is very sweet and compassionate, she has an ability to tell it how it is. She knew information that no one else knows. Great reading , felt like you knew me well, without any face to face contact, knew very much what I was thinking . Your reading was very blunt, and straight to the point. I like that! You have done everything exceedingly well. In fact, you have been the only psychic reader to actually give me “food for thought”. All my past readings have been quite disappointing, since I have very high expectations and some basis for recognizing truth. Other readers have focused on people in my life, not about ME. Thanks for seeing ME. Bless you – you have found a way to share your gift with humanity. I’m jealous! Absolutely pure truth! Jucy is a gifted psychic reader who utilizes a variety of methods to accurately answer your questions. This has been my first email reading, and I can say I truly enjoyed the experience. It was like being in the same room with Jucy – she has a kind and caring way about her. She is truly gifted! Supportive and resourceful, above and beyond the call of expectations. The reading proved helpful in helping me get centred at a time when I was feeling scattered. I was provided with objective observations and helpful guidance to achieve my higher path. A gentle, caring person who has a truly healing quality about her. Worth a read … pardon the pun. I very much enjoyed the reading – I don’t think there are areas for improvement. Jucy, thank you so much for giving me such a great reading! You were so specific about details surrounding my current situation, and my character traits. I will definitely be back for another reading! At a time of great confusion and anxiety, Jucy’s reading helped me to see things better. Her advice was great guidance for me to choose my own path. Thank you, Jucy. I just want to say thank you, my reading with you was unlike any other reading I have had. It really helped me see into my full situation adn to whom I am, My desires and my realities. You helped give me insight into my life and I truly recommend you to anyone who just feels confussed or lost with their life at that moment. I would get another reading from you in the future no doubt about that. You have a really calm energy which also helped me open up and feel comfortable. Thank you for also listening to me and taking the time to answer or look over anything that I was concerned about and even more. It was a pleaseure. Jucy was great. She zoned in on the very things that were happening in my world. She was gentle and understanding and listened well to some of the issues happening in my life and gave me some very clear and frank feedback. Jucy was great and really made me feel very comfortable. She was dead on with alot of her information and has really helped me decide the next steps in certain areas of my life. She was very honest and told me what she saw and not what I wanted to hear. Jucy was fantastic, she made me feel welcome, warm, and at east. Her gift of communicating accurately helped me to find clarity and resolution. She made my first experience with tarot reading a truly enjoyable one where I felt both accepted and guided. I was amazed at the sense of empowerment and safety that I felt as a direct result of her guidance. I would highly recommend her to anyone. I felt very at ease with you as I also felt that you were a pleasant and generous person.I was happy with the whole experience. I have to say it was probably one of the best readings I have ever had. Thank you…. In any case, I will recommend you to my friends. Jucy, your reading was very insightful and I really enjoyed talking with you. Hearing your description about myself solidified what I subconsciously believed. And, I look forward to the events you predicted with enthusiasm. I would not hestitate to call upon you in the future. Thank you, thank you, thank you. You are relaxed and easy to talk you which puts a person at ease. You are extremely insightful and I look forward to another reading. ccurate and clear. I have been to other tarot readers who may have been accurate but did not explain clearly. She is also very positive and motivating and nice to be around. She certainly answered my questions and helped me sort out some confusion. I will be back in the future. Jucy provided great insight and guidance into my area of concern. Even if some answers were not what I wanted to hear, I believe her words will lead me to make the right decisions and ultimately create a better future. I will most definitely be seeking her advise again. Barrie, Newmarket, Oshawa, Niagara Falls and most of Southern Ontario.